In March 2014, hydraulic fracturing – or fracking – caused 77 earthquakes in a small Ohio town that had no previous experience with seismic activity, according to a new study. One quake was large enough to be felt in neighboring areas. Fracking in Poland Township, Ohio was halted two days after the area was hit with a magnitude-3 earthquake along a hidden fault in rock which was deep beneath a natural gas well in the Utica Shale, according toresearch publishedin the Bulletin of the Seismological Society of America. The study's authors said the magnitude-3 quake was "one the largest earthquakes ever induced by hydraulic fracturing in the United States." All 77 quakes occurred between March 4-12, the study found. Besides the magnitude-3 quake, the study reported that most of the seismic activity was not felt by Poland Township's population, which numbered 14,960 in the 2010 census. No previous seismic activity had occurred in Poland Township, which sits near the Pennsylvania border, and the quakes stopped once fracking operations were put on hold, according to lead study author Robert Skoumal, a graduate student in seismology at Miami University in Ohio. To unleash oil or natural gas, fracking requires blasting large volumes of highly pressurized water, sand, and other chemicals into layers of rock. The contents of fracking fluid include chemicals that the energy industry and many government officials will not name, yet they insist the chemicals do not endanger human health, contradicting findings by scientists and environmentalists. Once used, toxic fracking wastewater is then either stored in deep underground wells, disposed of in open pits for evaporation, sprayed into waste fields or used over again. Fracking has been linked to groundwater contamination, an uptick in earthquakes in other states, exacerbation of drought conditions and a host of health concerns for humans and the local environment. Ohio and many other US states, including Oklahoma and Texas, have been subject to intense amounts of fracking in recent years, as the effects of the process have caused controversy from coast to coast. For instance, a separate study released in October found that fracking had a direct connection to some 400 micro-earthquakes in the eastern Ohio town of Canton. 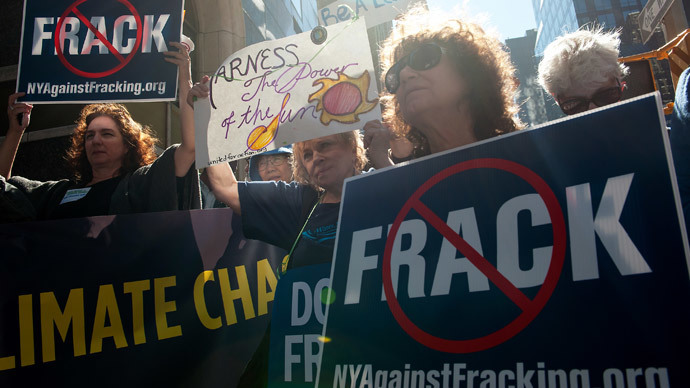 Last month, New York became the first US state to ban fracking. “I cannot support high volume hydraulic fracturing in the great state of New York,” said Howard Zucker, acting New York State Health Commissioner. He equated fracking to second-hand smoke, the health risks of which were not fully understood until many years of scientific studies were conducted. A fracking ban was recently instituted in Denton, Texas, a town of 123,000 located on top of the natural gas goldmine that is the Barnett Shale formation, the birthplace of the much-maligned oil and gas extraction method. In November, cities in Ohio voted on fracking ban measures, with mixed results. The cities of Gates Mills, Kent, and Youngstown – all located in northeast Ohio, near Poland Township – voted down bans, while the town of Athens approved one. Yet city bans are not always sure to remain in place, as local ordinances against fracking can run afoul of state laws that allow the process, as is the case in Ohio. In Colorado, for instance, state officials have worked to supersede local, voter-approved bans through the legal system.